You are well aware that the process of Verification of Membership in GDS cadre has been commenced and in progress. AIPEU-GDS (NFPE) has applied to participate in the verification process in the name & style ofALL INDIA POSTAL EMPLOYEES UNION - GDS (AIPEU-GDS). ALL INDIA POSTAL EMPLOYEES UNION - GDS (AIPEU-GDS) is one of the applicant Unions in the ensuing process of verification. For the first time AIPEU-GDS is participating in the membership verification process. Even though AIPEU-GDS (NFPE) formed in April 2012, with best efforts of leadership of NFPE and GDS created a sensation in establishing its organization in such a way in all Circles and divisions for the last four years. This time, the Department notified to get the information of 'Authorized Representatives' of respective GDS unions participating in the verification process, to counter sign the declaration form / Membership form in the divisions and accordingly submit the same by 15th June 2016. AIPEU-GDS today submitted the list of "Authorized Representatives" of respective divisions from 22 circles. It comprises more than 95% of Divisions from all 22 Circles. Remaining would get in a short notice. The trust and confidence on NFPE & AIPEU-GDS resulted in the listing of Authorized Representatives, stands for the cause of GDS to make it clear that only NFPE & AIPEU-GDS will safe guard the interest of GDS members. At this instance, our CHQ extends sincere thanks and respectful gratitude to all the leaders of NFPE from Divisional level to CHQ, General Secretaries of all affiliated unions of NFPE, well-wishers, veteran leaders, Senior Comrades who contributed their best efforts to support the AIPEU-GDS in the Divisions. Further congratulating the Comrade Representatives / Conveners / Secretaries / CHQ office bearers / Circle Secretaries / Active comrades / Members in divisions of AIPEU-GDS for their valuable contribution in popularizing the AIPEU-GDS to all corners of all Divisions and Circles. Some part of our exercise is over. The next foremost part of the exercise to enlighten the GDS members in the divisions to franchise their option in favour of AIPEU-GDS positively and get their valid choice to AIPEU-GDS to place it in first position in the process of verification of membership. It results in effective bargaining capacity of AIPEU-GDS and leads to the emancipation of GDS during this period of implementation of the recommendations of Pay Committee. Let us act swiftly and achieve our goal of 100% membership in GDS Union. 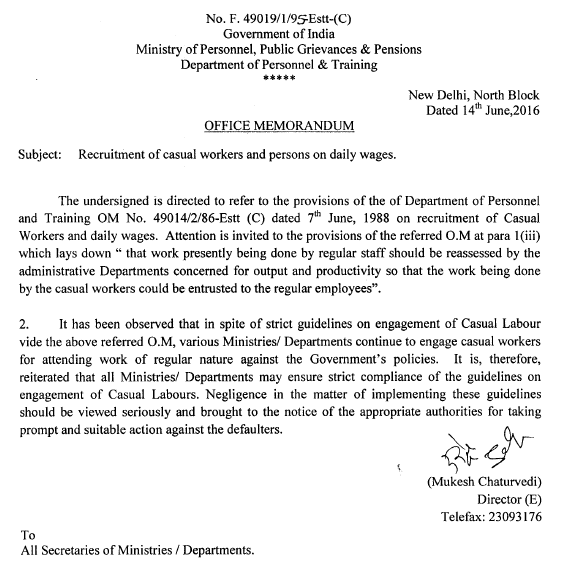 Recruitment of casual workers and persons on daily wages. Sub- Launch hour demonstration at Divisional level on 09-06-2016 and one day Dharna programme i/f/o CPMG office, Bhubaneswar-1 on 15-06-2016 at 10 AM in protest of non-settlement long pending problems of various wings of the Circle-reg. Ref- CO letter No WL/RJCM/Corr/2014 Dated 09-06-2016.
apro pos to the letter under reference, for attending the meeting on 14-06-2016 at 11 Hrs, it is to intimate that our C/S. 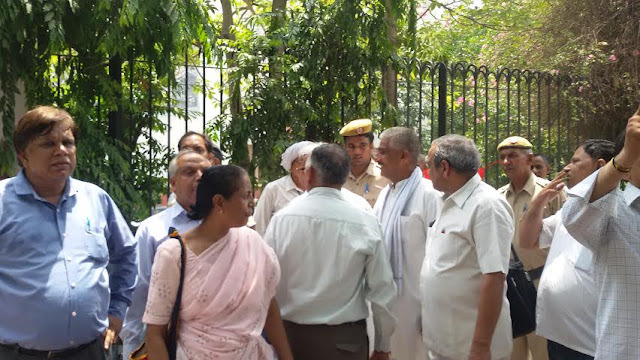 AIPEU GDS , Sri N. C. Singh’s name, who signed in the Memorandum has not been included for the meeting. A good number of demands of GDS were placed in the Memorandum for which his presence is highly required in the discussion. Therefore, it is not feasible on our part to attend the aforesaid meeting in the absence of C/S. AIPEU GDS Union. Government is firming up plans to set up 650 branches of India Post Payments Bank at all major district headquarters by September 2017, Telecom and IT Minister Ravi Shankar Prasad today said in a letter to all postal employees. "The India Post Payments Bank shall be set up with an investment of Rs 800 crore. The plan is to roll out 650 branches at all major district headquarters so that it may leverage the extensive outreach of the Department of Posts," Prasad said in the letter. The Cabinet on June 2 cleared the proposal to set up India Post Payments Bank (IPPB) with a corpus of Rs 800 crore and a plan for 650 branches operational by September 2017. It will be scaled up further to cover the entire country by the end of 2018-19. "The Prime Minister has urged that these 650 branches shall be made fully functional by September 2017," Prasad said. DoP is gearing up to launch the payments bank with a workforce of 3.5 lakh. Prasad, in his letter, reached out to all postal employees for support. "I earnestly appeal to all employees of the department and the Grameen Dak Sevaks to take pride and ownership in establishing the India Post Payments Bank which truly serves the cause of Antyodaya - serving the last man standing," he said. He reasoned that the postman has a vital emotional connect and is almost part of every family in villages. "In coming days, the role of all employees, including Grameen Dak Sevaks, will be very significant in successful rollout of the Payments Bank to make financial inclusion possible for every Indian," Prasad said. DoP at present manages around 1.55 lakh post offices, of which about 1.3 lakh are in rural areas. "I have no doubt in my mind that given your capabilities and your whole-hearted co-operation, we can accomplish the task. India Post has a footprint in every corner of the country," Prasad said. IPPB will offer digitally-enabled payments, banking and remittance services of all kinds among entities and individuals as also provide access to insurance, mutual funds, pension and credit products in partnership with third-party financial service providers and banks. "IPPB is being set up primarily to achieve the goal of full financial inclusion of the people in our country. It shall be a technologically-enabled banking platform that gives a wide range of services such as direct benefit transfers and all kinds of payments and remittances," the minister added. Next time if your postman happens to ask you for your signature on a handheld device, don't think it's forgery. Postmen have actually been equipped with new tools to take down people's signatures and immediately upload the deliveries. On Friday, Chief Postmaster General Ashok Kumar Dash announced that 'Pilot Postman Mobile Application' for real-time mail delivery has been initiated. This move will cover speed post, registered letter, and registered parcels, among others. India Post has launched the app that will keep a tab on movement of your article to its destination. "In Maharashtra Circle 18, postmen working at Bhandup East post office have been supplied with the smartphone loaded with Postman app, which has features of receiving the articles, obtaining e-signatures, uploading the data on the spot to the central server, etc," said Dash. Once you 'ink' your signature on the smartphone, the details of delivery will be immediately uploaded to the central server, thereby, updating the records that the article has been delivered. This system is similar to what's used by some of the private premium courier agencies, which update pick-up to delivery of any article on the palmtops. The plan is to gradually increase the use of smartphones, but only after the results of the pilot project. Meanwhile, an e-Commerce Parcel Processing Centre in Airoli is being developed on a plot of 4,000 sqmt. The complex would also house Airoli Post Office. In Maharashtra, six locations have been identified for setting up of first year roll-out of India Post Payment Bank. This will be rolled out between January 2017 and March 2017. The six locations are Girgaum in Mumbai, Thane RS Sub-Office, Nagpur GPO, Cidco Colony in Aurangabad, Pune City Head Office and Satara Head Office. 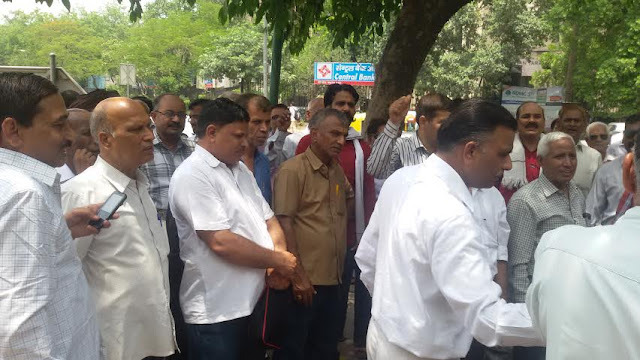 On the call of National Joint Council of Action (Railway, Defence, Confederation, NFPE & FNPO) Postal JCA Leaders have served Strike Notice to the Secretary Department of Post today on 09.06.2016 after massive demonstration in front of Dak Bhawan, New Delhi. Indefinite Strike will commence from 11th July 2016, if no settlement on the 11Points Charter of Demands by NJCA & 4 Points Charter of Demands by PJCA. Please start preparations right now to make the strike a grand Success. 35 LAKHS CENTRAL GOVERNMENT EMPLOYEES TO COMMENCE INDEFINITE STRIKE FROM 11TH JULY 2016. 40 LAKHS CENTRAL GOVERNMENT PENSIONERS ALSO WILL JOIN THE PROTEST ACTION THROUGHOUT THE COUNTRY. LARGEST PARTICIPATED STRIKE ACTION OF CENTRAL GOVERNMENT EMPLOYEES TO BEGIN AT 6 AM ON 11TH JULY 2016. 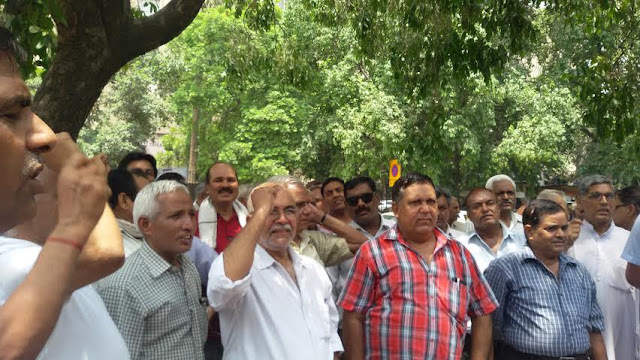 The National Joint Council of Action (NJCA) comprising Postal, Railway & Defence organizations are decided to serve strike notice to the Govt on 9th June 2016 to organize the indefinite strike from 11th July 2016 on 7th Central Pay Commission related issues. AIPEU-GDS CHQ requesting all the CHQ office bearers, Circle Secretaries, Divisional & Branch Secretaries to serve the strike notice on 09-06-2016 at all levels along with NFPE unions to participate in the indefinite strike from 11th July 2016. In case of GDS also, the 7th CPC had made adverse comments even though the CPC has not taken up the issues of GDS in to their purview. The Commission accordingly recommends that the Department of Posts budget and account for remuneration of Gramin Dak Sevaks under a head distinct from ‘salaries’ as they are not reckoned as Central Government employees. Para - 11.8.48 : A demand has been made before the Commission for treating Gramin Dak Sewaks (GDS) as civil servants at par with other regular employees for all purposes. 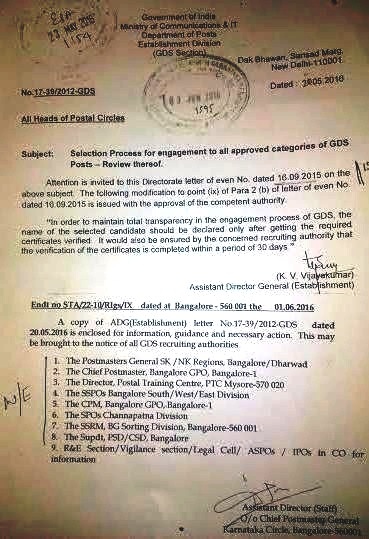 a. GDS are Extra-Departmental Agents recruited by Department of Posts to serve in rural areas. b. As per the RRs, the minimum educational qualification for recruitment to this post is Class X.
c. GDS are required to be on duty only for 4-5 hours a day under the terms and conditions of their service. 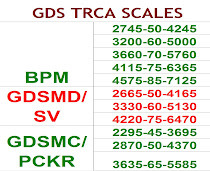 d. The GDS are remunerated with Time Related Continuity Allowance (TRCA) on the pattern of pay scales for regular government employees, plus DA on pro-rata basis. e. A GDS must have other means of income independent of his remuneration as a GDS, to sustain himself and his family. Para - 11.8.50 : Government of India has so far held that the GDS is outside the Civil Service of the Union and shall not claim to be at par with the Central Government employees. The Supreme Court judgement also states that GDS are only holders of civil posts but not civilian employees. The Commission endorses this view and therefore has no recommendation with regard to GDS. The above comments made on GDS are reflecting the policy of the Govt that the GDS should be remained as GDS and has no provision or consideration to accord CIVIL SERVANT STATUS. The ambition of every GDS is to get "Civil Servant Status". For the cause of this issue, every GDS would get ready for any kind of sacrifice. Now this is the right time to participate in the indefinite strike along with all Central Govt organizations to ratify the adverse comments on the GDS. AIPEU-GDS CHQ to call upon all Gramin Dak Sevaks to participate in the indefinite strike from 11-07-2016 and make it a grand success.